Oh wait, you can’t understand what I’m saying. Im Ellie. I’m my mom’s first fur baby. Don’t let that human toddler say any different now. 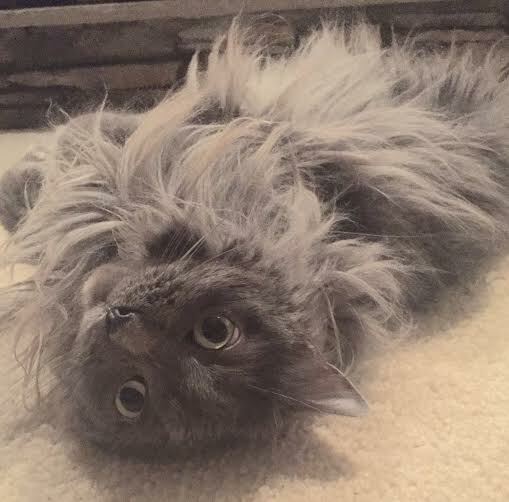 I’m almost 8 years old this May so that makes me like 300 years old in cat years, or something like that. I’m the cat behind the blog. The one and only if you please and I hope to keep it that way. My parents keep talking about getting a dog but no way will I let that happen in this household. I’m the Queen after all. So what can I tell you about myself? My Dad bought me while he and my Mom were in college. She had wanted a cat every since she was about 5 years old so she cried when my Dad set up a scavenger hunt in their off campus house together for her to find me. She said it was some sort of two year anniversary gift. 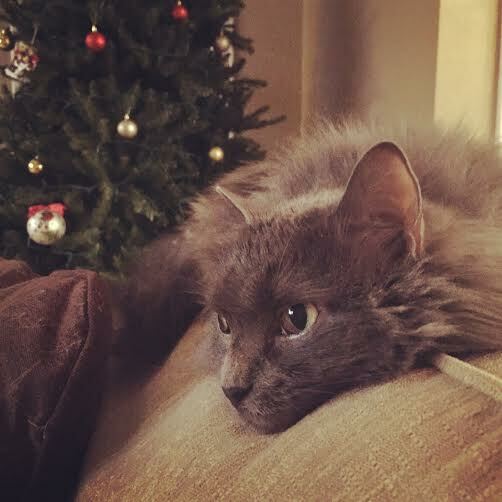 He saved me from a woman who previous had found me as a kitten with a brother of mine. My tail had been caught in a trap and that’s why I have a funny kink to it which Mom always tells me I’m special because of it. My original name was Sassy and I fit it to a T. I know what I like and what I don’t. She wanted to change it and since the movie UP was one of her my Dad’s favorites, she wanted to name me Ellie after one of the main characters. My favorite thing to do is nap. I nap almost anywhere but my favorite spots are my sister’s Sophia The First tent and her Minnie Mouse couch. I find both to be really soft, comfortable and cozy. Of course, my Mom’s lap is another favorite spot to cuddle. I’m a big cuddle bug but only with my Mom. She’s my best friend and the only person I allow to hold, cuddle or pick me up. Sometimes my sister cries because she wants to hold me, which my Mom allows her to for a few seconds but she mainly picks me up and throws me on the ground. Toddlers right? My favorite food is the wet food my Mom brings home once in a while. It’s a meat flavor it all tastes delicious. I smack my lips for a good half hour after eating it. She’s the best when she brings me that treat. I also love chicken, yogurt and milk although they are only for special occasions. Isn’t it my birthday every day though? I’m a scaredy cat. No really. I sometimes get afraid of my own shadow because I think someone is creeping up behind me. Loud noises make me jump even if it’s a door slamming. I’m always on edge and alert for what’s to happen next. I guess you wouldn’t want to sneak up on me because I might attack you out of fear. Dogs. Yeah, don’t get me started on their loud bark. I’ll hiss at those beasts until I’m hoarse. Darn dogs. 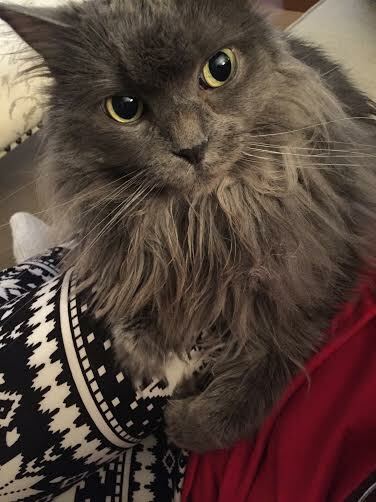 I’m a Persian mix for those of you who have noticed my amazing grey coat. My parents don’t know what the other mix part is but it just makes me even more special. I have super long whiskers which the vet tells me must make me a great mouse catcher. I proved my point a few years ago when I found a mouse in my grandparent’s basement, brought it to my mom with pride and then wondered why she hadn’t praised me. All I did was play with the thing for 45 minutes. She was screaming the entire time which I still don’t get why. Mice are super fun to play with and I’m the best to get them! I’ve moved 5 times in 6 years. I went from my parent’s college home in Iowa, to my grandparents home in Chicago when my Mom went to Grad school, to my parents first home together in a suburb of Chicago and then flew on in airplane to their new home in Atlanta, both in an apartment and then another house. It’s been a busy 6 years that’s for sure but I’ve always acclimated well to my surroundings. Now my mom let’s me go out on their patio because it’s screened in and I can actually attempt to catch those pesky birds although the screen gets me every time. I’ll get through someday! I hear my Mom wondering where I am so I better get off this thing she calls her ‘alone time’. Hope to see you all again soon! My heart just melted!!! ADORABLE! awwwwww she is so sweet and adorable! sassy ellie, love it. Such a fun post! She's a cutie! 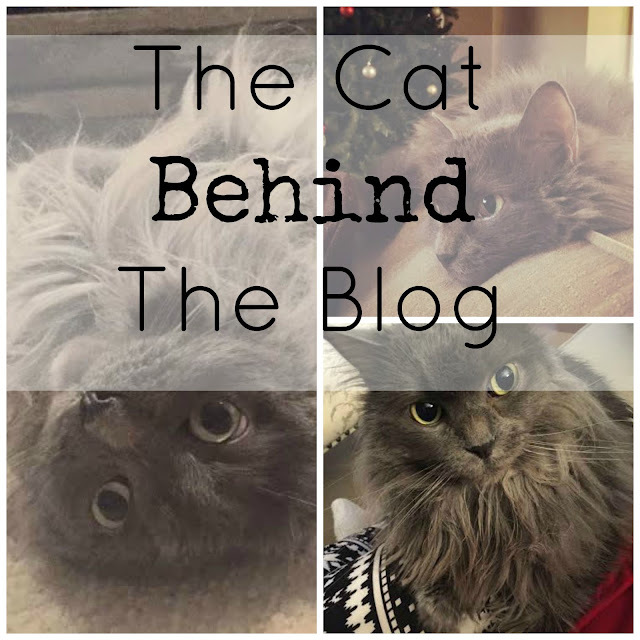 Such a fun post about your sweet kitty. I just adopted a kitty cat a month ago. She loves napping everywhere too. I love, love, love this! I have three kitties at home & all of them are quite special. omg cats. I'm so into this it's not even funny. Did we just become best friends? Cute post. I use to have cats, now dogs! My mini dachshund is 13 years old and I feel pretty blessed to have her this long. Glad to meet Ellie! This is SUCH a cute post idea, Cait! Might have to do something with my cats now...they need the spotlight!